Churches are not in good terms with banks as banks are foreclosing churches in a record high numbers as Churches fail to make payments. In 2011, 138 churches were sold by banks, an annual record, with no sign that these religious foreclosures are abating, according to CoStar. That compares to just 24 sales in 2008 and only a handful in the decade before. The church foreclosures have hit all denominations across America, black and white, but with small to medium size houses of worship the worst. Most of these institutions have ended up being purchased by other churches. The highest percentage have occurred in some of the states hardest hit by the home foreclosure crisis: California, Georgia, Florida and Michigan. “Churches are among the final institutions to get foreclosed upon because banks have not wanted to look like they are being heavy handed with the churches,” said Scott Rolfs, managing director of Religious and Education finance at the investment bank Ziegler. 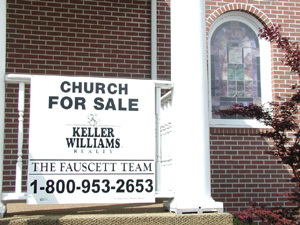 Church defaults differ from residential foreclosures. Most of the loans in question are not 30-year mortgages but rather commercial loans that typically mature after just five years when the full balance becomes due immediately. Its common practice for banks to refinance such loans when they come due. But banks have become increasingly reluctant to do that because of pressure from regulators to clean up their balance sheets, said Rolfs. President Obama Wins 2012 Elections, Second Term in Office!